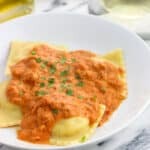 This recipe for lightened up/light vodka sauce is a healthier way to enjoy Italian comfort food. 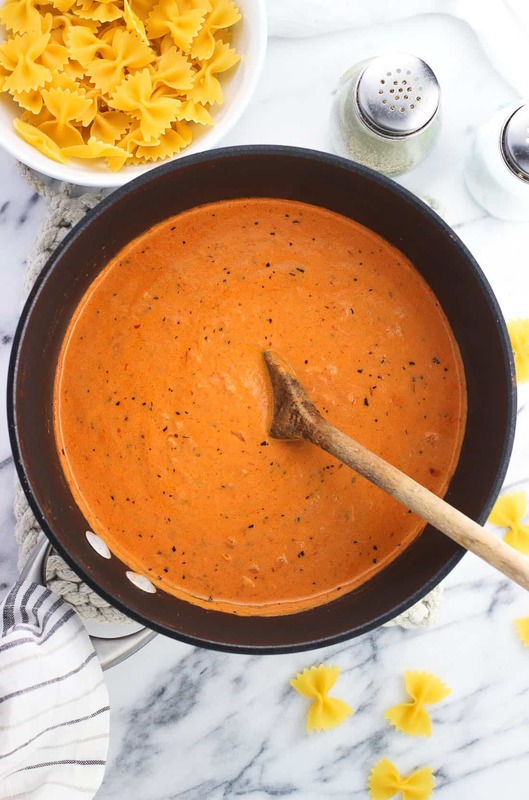 This easy homemade vodka sauce substitutes in fat-free half-and-half for a lower fat but creamy sauce without any worries of it separating. If there’s ever a sauce that screams Italian-ish comfort food, I think it would be vodka sauce. Penne alla vodka was a staple at so many catered Italian gatherings and restaurants when I was growing up that I can’t even begin to quantify how many pounds of it I’ve eaten in my lifetime. More than a trivial amount, that’s for sure. It was also something I so closely associated with other people (i.e. restaurants) making that I never thought to make myself at home. Until now! Or, at least until a few years ago when this lightened up/light vodka sauce first hit the blog. It’s the same delicious recipe, just with improved photos. 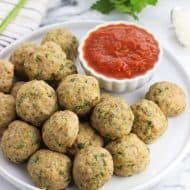 I know you’re supposed to get agita thinking about using fat-free dairy in sauces, especially ones that feature acidic ingredients such as tomatoes. I know, I know. I’ve thrown caution to the wind and experimented with low or no fat dairy in cooking before and have ended up eating a reheated frozen veggie burger for dinner because of the whomp status of my Plan A meal. But this recipe has turned out exactly as I’ve hoped for each and every time I’ve made it, so I suppose I’m a bit superstitious. Each time, I stirred together the heavy cream and fat-free half and half before adding it at once to the sauce. In a silly way it seems like I’m trying to pull a fast one on the sauce, but logically I figured mixing full fat + no fat = some fat, and some fat dairy > no fat dairy as far as sauces go. Each time I also watch the sauce simmer with a critical eye; ready to pounce on the first sign of grainy separation or curdling, but my fears always go unrealized. Instead, the veggie burgers stayed put in the freezer and we inhale this creamy, slightly spicy, can’t-believe-it’s-lightened up, can-I-please-eat-it-with-a-ladle vodka sauce. 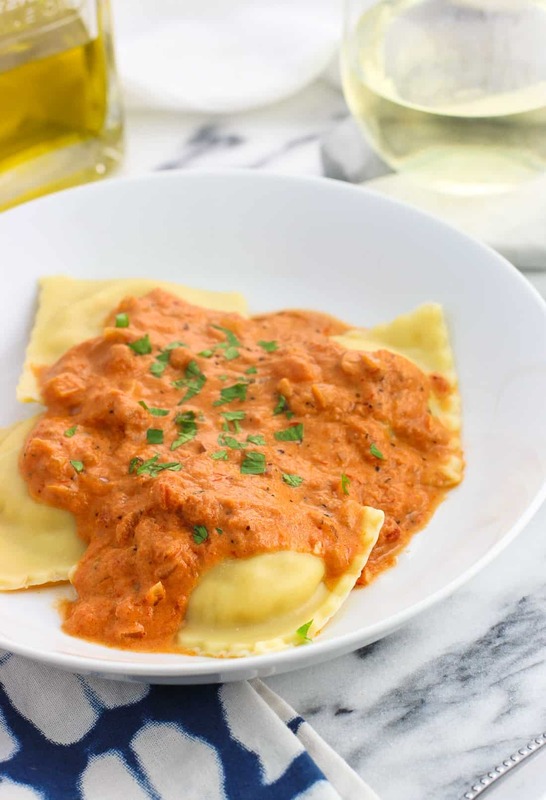 I would not use all fat-free half-and-half as that likely would not add enough fat to maintain a cohesive and creamy texture to this lightened up vodka sauce. The crushed red pepper flakes add a small amount of flavor. They definitely don’t make it spicy. You definitely don’t need to use a premium vodka here, but keep in mind if you’re buying a whole bottle, you’ll have to use it somehow. Maybe in these pomegranate moscow mules? 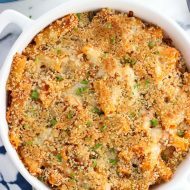 Extra vodka sauce makes a delicious ingredient in this vodka sauce pasta bake with crispy panko and bacon! 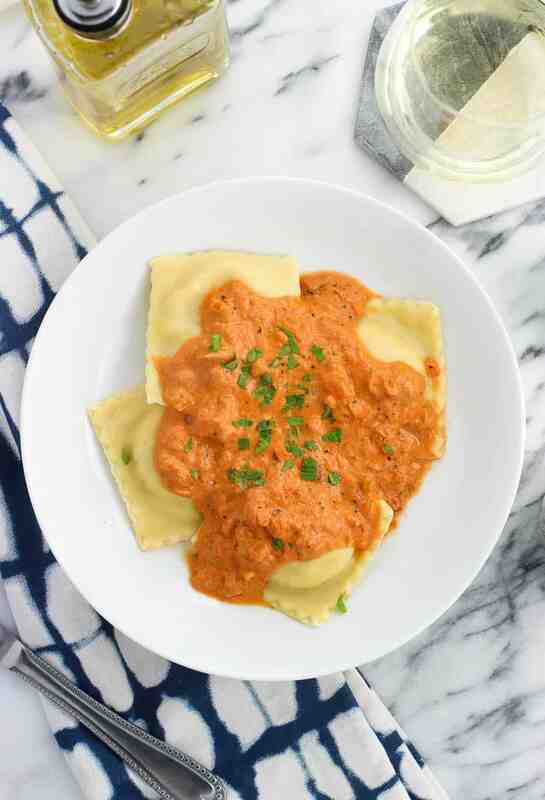 This recipe for lightened up vodka sauce is a healthier way to enjoy Italian comfort food. 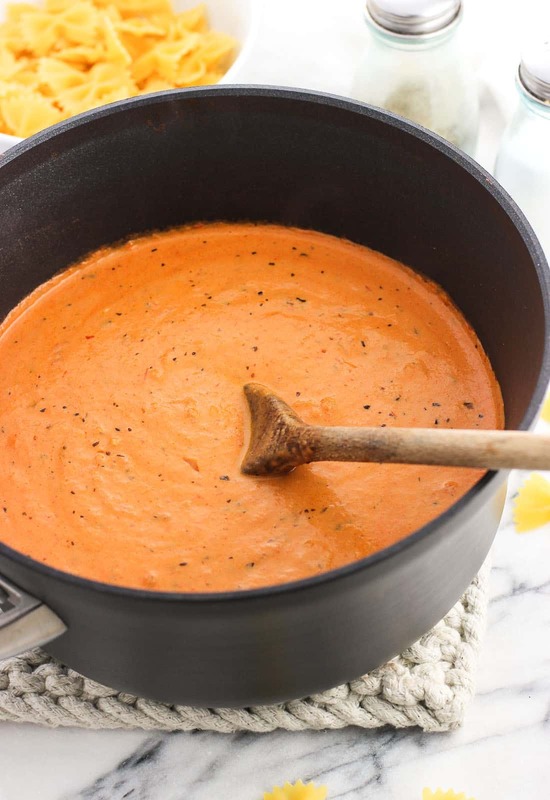 This easy homemade vodka sauce substitutes in fat-free half-and-half for a lower fat but creamy sauce without any worries of it separating. Add olive oil and diced onion to a medium saucepan set over medium-low heat. Stir occasionally and let onion cook for about 5 minutes, or until onion pieces have begun to soften. Slowly pour in vodka. Cook for 7-9 minutes, or until onion pieces have browned slightly. Add crushed tomatoes, garlic, basil, oregano, and red pepper flakes, if using. Stir everything together and cook for 15-20 minutes. Stir occasionally. In a small bowl or measuring cup, stir together heavy cream and fat-free half and half. Once tomato and onion mixture has cooked for 15-20 minutes in the above step, pour in cream mixture, stirring constantly while pouring. Cook for 5 minutes over medium-low heat while stirring frequently, then reduce heat to low to cook for 8-10 minutes, stirring occasionally. Pour over pasta to serve or use in place of tomato sauce in your favorite recipes. Sauce can be refrigerated for several days. I will be making this again and again! 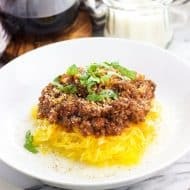 It’s one of my picky daughter’s favorite pasta recipes and now so much less guilt for me to go back for seconds! I always forget about vodka sauce, but then every time I have it, I remember how much I love it. This is perfection! 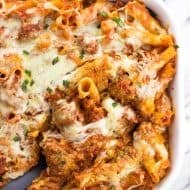 I’ve never had a vodka sauce, and this looks just amazing! I might toss it into salad, too. haha This must take pasta to a whole new delicious level! 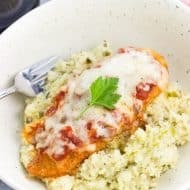 I love using FF h&h in my vodka sauce, it’s the perfect fix without losing that yummy velvety texture! this looks so good Alyssa, and I am obsessed with that bowl! Yesss, I so agree! FF half & half for the win. And thanks! Pasta is a staple around here for sure. I’ve been looking for a lighter version of vodka sauce! Thanks so much for ending my search. 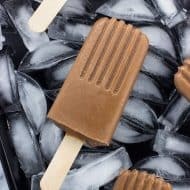 🙂 This looks deeeeelicious! Thanks Tina! Vodka sauce is definitely an indulgence, but I’m very glad to have concocted a healthier version that’s still just as satisfying!